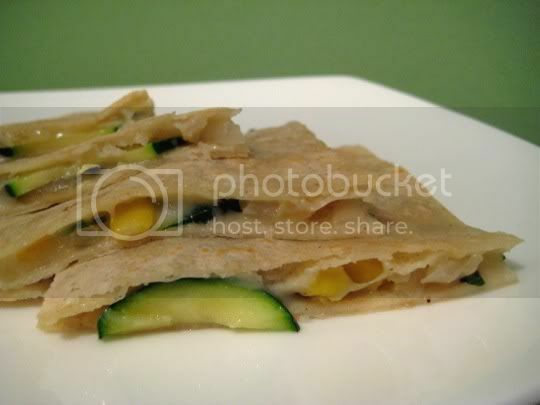 An interesting taste and twist on quesadillas, these are filled with sauteed onions, zucchini, and corn...but they are strangely addictive! Something about the flavor combination of sweet onions and corn, the mildly sweet and juicy zucchini, and the herbal citrus notes of cilantro work very well together. And of course, there's the ooey gooey melty Monterey Jack cheese! The cheese is actually mixed into the the sauteed veggie mixture, so it melts and covers everything, instead of being layered on the tortilla during cooking. I think this actually gives the quesadillas more of their ooey-gooeyness, and served hot, they are amazing! A great complement to these flavors is something sour or tangy, so serve the quesadillas with lime wedges or a spicy salsa. Yum! Make again? Yes, a wonderful summery Mexican treat!